First of all…wow… I’m very happy to have inspired you in making this beautiful dress, Ju 🙂 I can’t wait to see your version! I started to write a reply to Ju, but I soon realised that it would be too long and complex for a comment. So I decided to write a post. Indeed I thought it could be useful also for other girls and obviously for me, in order to receive some suggestions for the next dresses. This is my first lining ever, so I’m sure it is not perfect at all! 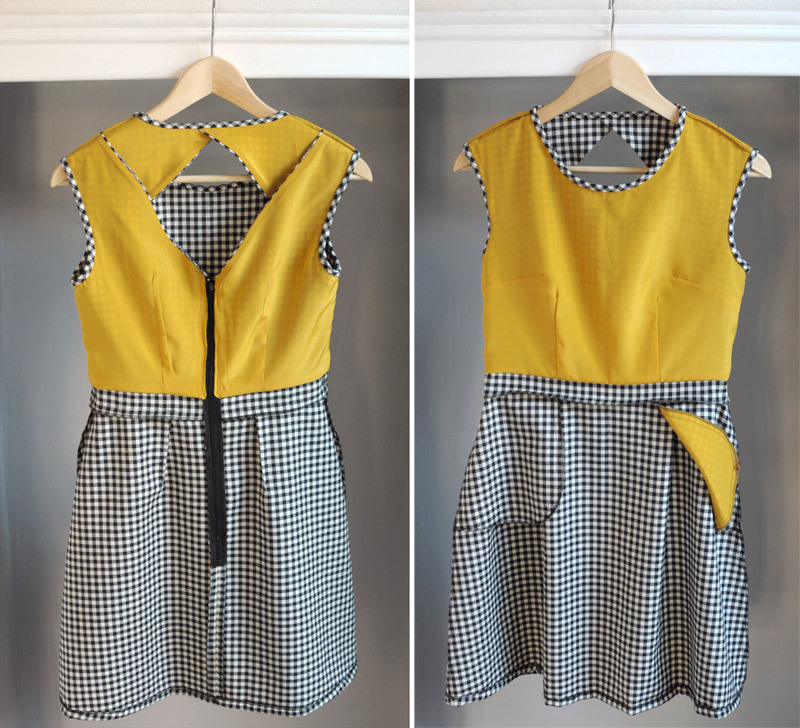 The dress is made in a beautiful Vichy wool. Unfortunately wool in direct contact on my skin has always bothered me, so I lined the dress. I decided to only line the bodice because I had 50 cm of this mustard silk barely and I had no time to go back to the shop. I have no problem of sticking with my opaque tights, and anyway if I’ll have problems of sticking in the future, I’ll probably sew an underskirt. Nevertheless if you have enough fabric I suggest you to line the whole dress. It’s been quite difficult to write this post because I didn’t take any picture or videos over the work and it was a quite complicated process. Moreover I sewed this dress in January, so I was scared to forget some steps. I tried to be as clear as I could. I cut the same pieces of the front and back bodice in the silk fabric I used for the lining. 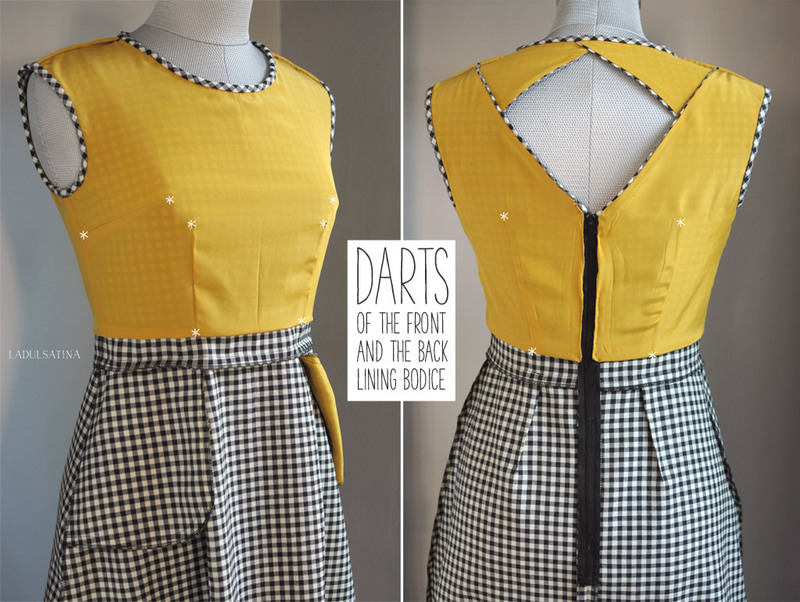 I sewed the darts of the front and the back lining bodice as the front and the back of the main fabric bodice. I sewed the lining and the main fabric of the upper back bodice (1) together only on the diagonal, right sides together. I finished the seam allowance with the serger. Then I turned inside out (wrong sides together), ironed the diagonal and basted along all the other sides, using a 0,5 cm seam allowance, to keep the lining still. Before the basting you can topstitch the diagonal, if you like (I didn’t make it). 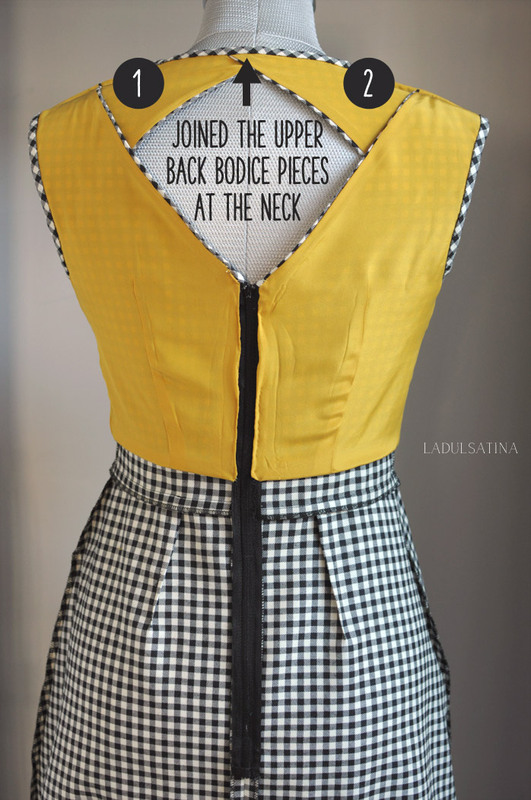 Do the same with the second upper back bodice (2). 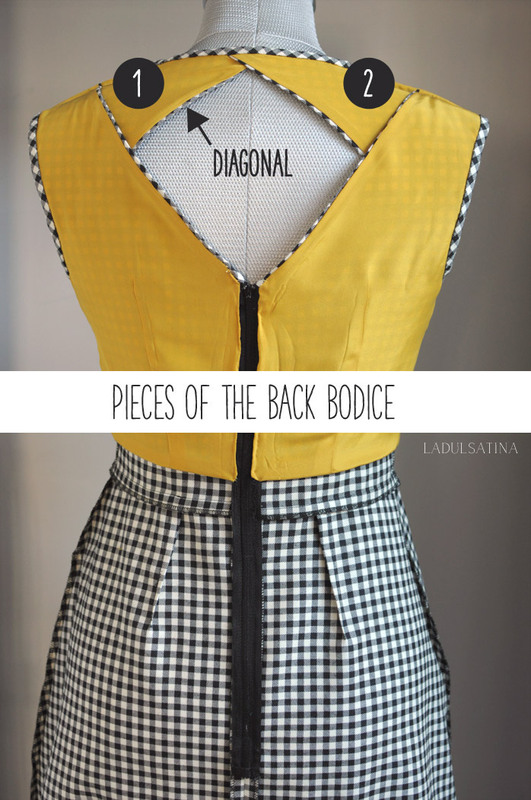 Then I sewed the lining and the main fabric of the lower back bodice (3) only on the diagonal, right sides together. Don’t stitch up to the end of the diagonal, leave 1,5 cm for the zipper (you’ll sew this 1,5 cm of lining to the main fabric by hand later, after you have applied the zipper). I finished the seam allowance with the serger. I turned inside out (wrong sides together), ironed the diagonal and basted only along the shoulder, using a 0,5 cm seam allowance, to keep the lining still in that side. As above, before the basting you can topstitch the diagonal, if you like (I didn’t make it). 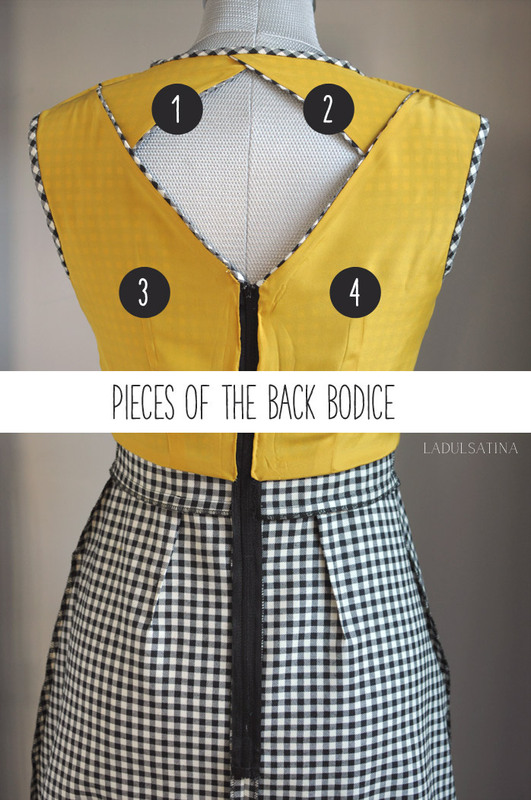 Do the same with the second lower back bodice (4). 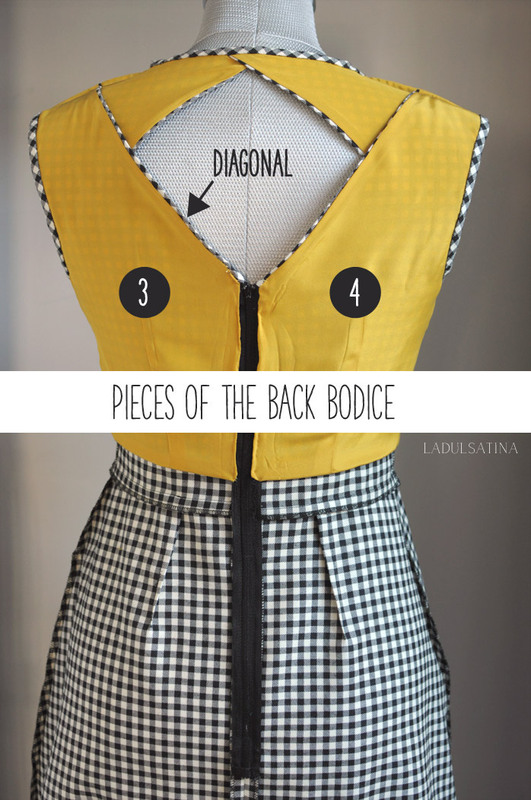 I sewed the upper (1) and lower back (3) bodice together, as written on the instructions, but in the armhole I sewed the upper back bodice (1) only to the main fabric of the lower back bodice (3) (leave the lining of the lower back bodice free). Use a 0,5 cm seam allowance as written. Do the same with the other two pieces (2 and 4). I basted the lining and the main fabric of the front bodice on the shoulders, using a 0,5 cm seam allowance. Then I joined the front bodice to back bodice at the shoulder, as written on the instructions, but using a French seam. 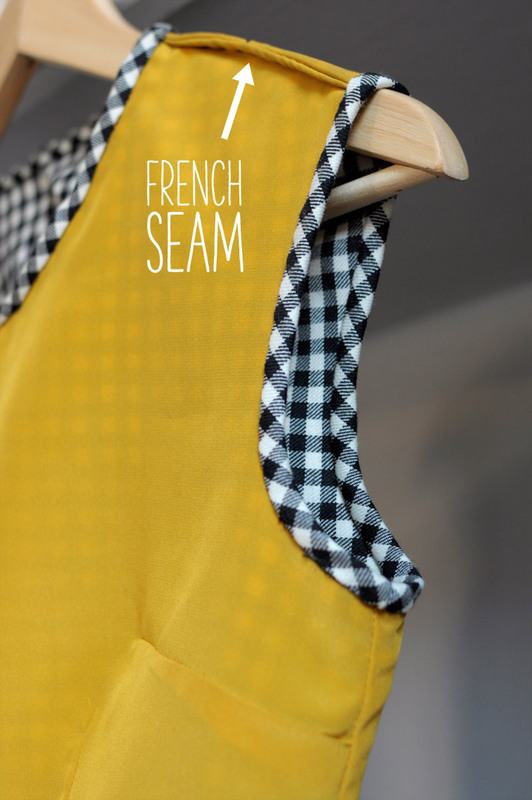 I have to say that the French seam with my two fabrics (wool and lining) is quite thick, so if you like you can try with a traditional seam and finish the seam allowance with a serger. It’s up to you. Then I joined the upper back bodice pieces (1 e 2) at the neck as written on the instructions. I sewed the sides of the lining together (right side together) and finished the seam allowances with a serger. I sewed the sides of the main fabric together (right side together) and finished the seam allowances with a serger. So I had a bodice of main fabric and a bodice of lining joined on the shoulders. I stitched the waistband and sewed it on the bodice, as written on the instructions (I sewed the waistband on the main fabric and I kept the lining free). Now the most difficult step to describe…I hope to be clear. I sewed the lining to upper seam allowance of the waistband (the seam that joins the bodice and the waistband). In order to do it, you have to turn inside out the lining and the main fabric bodice in order to have the right side of the lining against the wrong/inner side of the waistband and the seam allowance of the waistband. I stitched them with the sewing machine, but you can also stitch them by hand. Be careful to stitch inside the seam allowance in order to not have this seam visible outside on the right side of the dress. 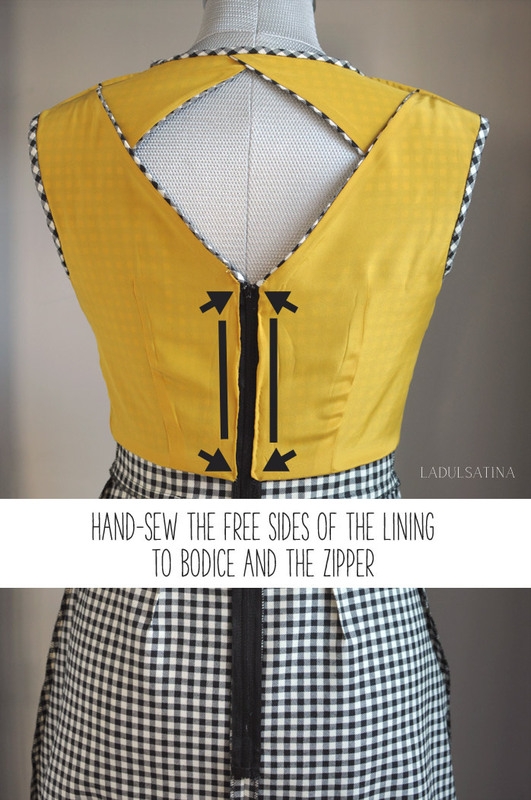 Leave 1,5 or 2 cm for the zipper on both sides (you’ll sew this 1,5 or 2 cm of lining to the main fabric by hand later, after you’ll have applied the zipper). I finished with the serger very cautiously. Then turn it inside out again. Now you have the lining bodice and the main fabric bodice joined on the shoulders and on the waistband. 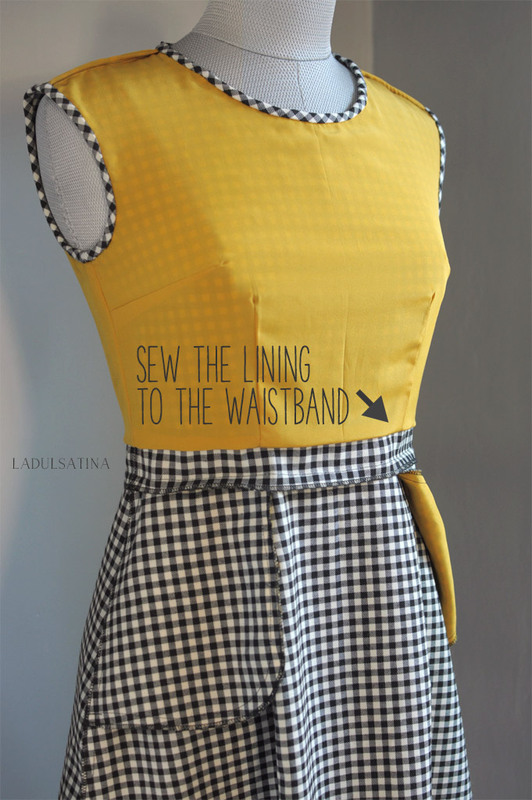 Then I made the bias tape following this Colette Patterns tutorial. I basted the lining and the main fabric in the armholes, using a 0,5 cm seam allowance, to keep the lining still. I sewed the bias tape with the sewing machine on the right side and I hand-sewed it on the wrong side, in order to not have visible seams outside. I used the same process for the neckline. Be careful to hide every bastings you made with the bias tape. Now I followed the next steps, as written on the instruction (I sewed the skirt, the zipper and the skirt hem). In the end I hand-sewed the free sides of the lining to bodice and the zipper. If you have any suggestion, please do not hesitate to write it in the comments below…I would be very happy to hear your opinions! Thank you in advance! You can find more picture of my Belladone Dress here. Thank you, your post was super helpful, I am planning on making a flower embossed black jaquard version of the Belladone fully lined with a purple-gray lining fabric, and your explanation was superb. 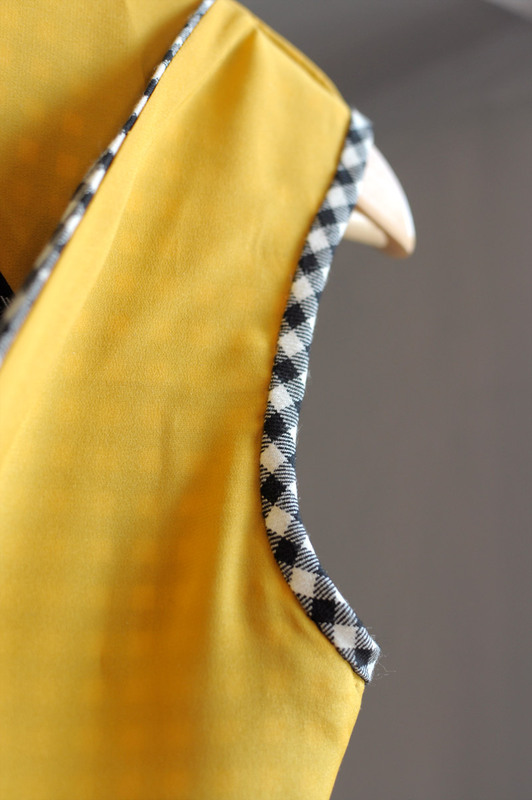 I love your choice of the mustard silk lining, it looks fantastic with the black and white with your fabric! Thank you sooo much Martina for writing this post and answering my question so fully!! I have had to put this dress on the back burner for now as I have to make a different dress for a wedding I’m going to. Wish me luck, it will be my first dress ever but I keep you in my mind all the time for your encouraging comments to me. Grazie!